Special CBI Court of Judge B.V.L.N. Chakravarthi in Hyderabad has sentenced former Chairman of Satyam Computers B. Ramalinga Raju and nine other accused in the Satyam Computers scandal to seven years rigorous imprisonment and imposed varying amounts of fine. Satyam Computer Services was once India's fourth-largest software services firm. The company, which was listed in New York as well as on the Indian stock markets, specialized in business software and back-office services for clients in the United States and Europe. Ramalinga Raju and his brother Rama Raju, former Managing Director, have been fined with Rs.5.5 crore each, while the eight other accused were asked to pay a penalty of Rs.50 lakh each. 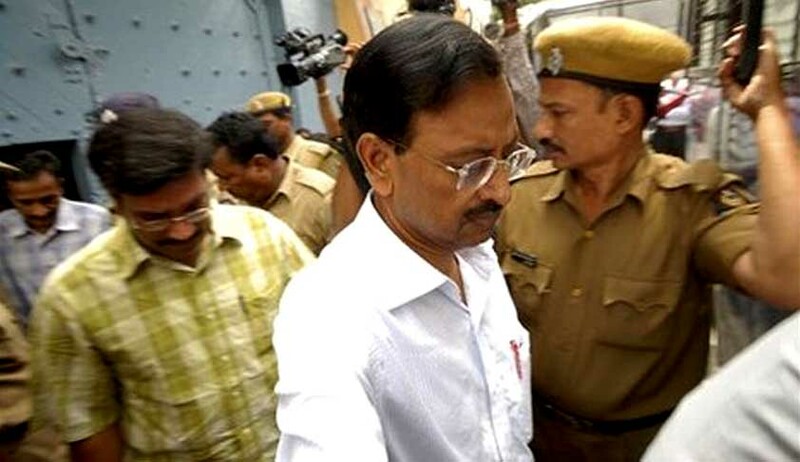 Ramalinga Raju has already served jail sentence from January 10, 2009 to August 19, 2010. He was freed on bail by the High Court in Hyderabad in August 2010. Following the cancellation of the bail by the Supreme Court, he was again lodged in jail from November 10, 2010 to November 5, 2011. The Court rejected Raju’s plea of leniency because of Raju's philanthropic activities. "I am of the opinion that a case involving economic offences, having a deep-rooted conspiracy and causing a huge loss of investor money, needs to be viewed seriously and considered as grave offences affecting the reputation of the corporate system of the country as a whole and the economy of the country. It is not a fit case for taking a lenient view on the quantum of sentence," the Court said. Along with the two brothers, the others found guilty are B. Rama Raju, Srinivas Vadlamani (former Chief Financial officer), S. Gopalakrishnan and Taluri Srinivas (partners Price Waterhouse), B. Suryanarayana Raju, Prabhakar Gupta (internal auditor), G. Ramakrishna (Head, Finance), D. Laxmipathy and Venkatpathi Raju. Ramalinga Raju was accused under Sections 120-B read with 420 IPC. He was also convicted under Sections 409, 467, 468, 471, 477-A and 201 of IPC. The sentence under the various charges will run concurrently. External auditors Gopalakrishnan and Talluri Srinivas and Ramakrishna were also convicted under section 419 (impersonation). Ramalinga Raju, V. Srinivas, S. Gopalakrishnan Talluri Srinivas, G. Ramakrishna, senior manager (Finance) D. Venkatapathy Raju, assistant manager (finance), Ch. Srisailam were convicted under sections 467, 468 (forgery), 471 (using forged documents as genuine) and 472-A (fudging of accounts). B. Ramalinga Raju, B. Rama Raju, V. Srinivas, Gopalakrishnan, Talluri Srinivas, Suryanarayana Raju and G. Ramakrishna Rau were also convicted under section 201 (destruction of evidence). Mr. Ramalinga Raju and B. Rama Raju, were also found guilty under additional section 409 (Criminal breach of trust). The case was one of the biggest corporate frauds in India, displaying International implications. 226 prosecution witnesses were examined, 3,137 documents marked as material exhibits. It had had rocked India and led to a massive upheaval in the software and Information Technology Enabled Service (ITES) industry in the country was investigated by the Central Bureau of Investigation. Ramalinga Raju allegedly confessed to manipulating his Company’s account books and inflating profits for several years, amounting to crores of rupees. "The concern was that poor performance would result in a takeover. It was like riding a tiger, not knowing how to get off without being eaten," he wrote in his letter to shareholders on January 7, 2009. He was then arrested by Andhra Pradesh Police's Crime Investigation Department along with his brother Rama Raju and others on January 11. Satyam was purchased by Mahindra and Mahindra owned Company Tech Mahindra in April, 2009. CBI took over the investigation in February 2009, and filed three charge sheets on different dates. These were later clubbed into one. The first two charge sheets dealt with the account fudging by Raju with the assistance of nine others, while the third charge sheet relates to "violation" of various Income Tax rules. It was asserted by CBI that the scam had caused a loss of Rs. 14,000 crore to shareholders of Satyam. The accused had contended that they were not responsible for the fraud and that all evidence produced has been fabricated. A chargesheet under the Prevention of Money Laundering Act was also filed by the Enforcement Directorate. Subsequently, in January, 2014, Ramalinga Raju's wife Nandini Raju and sons Teja Raju and Rama Raju were among 21 other relatives of his, who were convicted by a Special Court for Economic Offences in Hyderabad for default in Income Tax payment. Ramalinga Raju, Rama Raju, Vadlamani Srinivas and former director Ram Mynampati were sentenced to six months jail term on December 8, 2014 and fined by the Special Court for Economic Offences in connection with complaints filed by Serious Fraud Investigation Office (SFIO) for violation of various provisions of the Companies Act.